Cam Newton has given out more than a few celebratory fist bumps this season, but his latest pound was just a little bit cooler than usual. Newton led the Panthers to a 21-20 win over the Atlanta Falcons on Sunday, clinching the NFC South title and a first-round playoff bye for Carolina. Newton scored two touchdowns and also threw a game-winning 7-yard strike to tight end Greg Olsen late in the third quarter. After the score, Newton did a little celebrating with one of the littlest people in the Georgia Dome. Newton got the ball from Olsen after the touchdown and ran it over to the fans just behind the end zone. 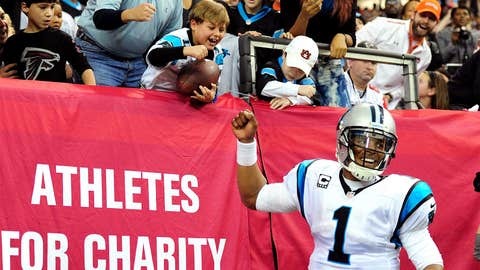 One young fan stood out among the crowd, though, and Newton trotted over to celebrate the score with the boy, who was wearing Newtonâs jersey. The quarterback handed the division-clinching football to the young fan and even offered a fist bump before taking off back to the bench. Check out the excellent moment in the GIF below.